#ThankAWoman #WomensHistoryMonth June Cline | Enjoy Life and Do Good! Today I say, “Thank You” to my long-time friend, June Cline, CSP the Southern, Sassy, Harley-riding Humorist. Starting in the speaking business about the same time, we’ve encouraged and advised each other through lots of ups, downs and crazy adventures. We’ve cried together in valleys and celebrated together on mountaintops and laughed all along the way. What I admire most about June is that she says, “Yes!” and then figures out a way. She’d always dreamed of riding her own Harley. When an opportunity appeared she bought “Good Golly Miss Molly” sight unseen. THEN took motorcycle riding lessons! After lots of bruising and bleeding from dropping the bike she was discouraged. She didn’t quit. She took another class! June has been riding Miss Molly for several years now, sometimes with groups and sometimes alone. Difficult as it was to learn, she never gave up. June approaches her business and her life the same way. Never afraid to put herself out there and go for what she wants. Every time she falls or gets knocked down she gets right back up and tries again. In the past year she’s produced and performed two one-woman shows, co-hosted a People’s Choice nominated podcast on Happiness and co-authored an Amazon bestselling book, The Happiness Recipe. Thanks to June for friendship and a great example of tenacity and resilience! 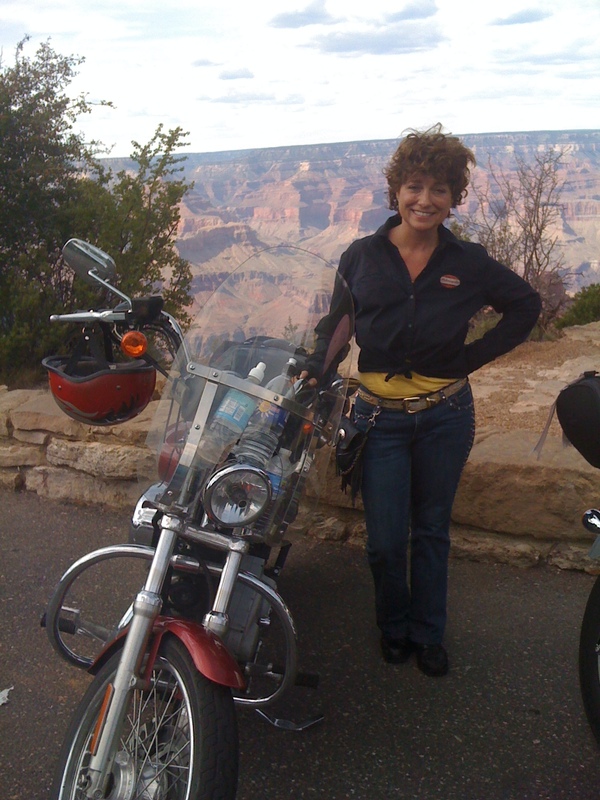 This entry was posted in Make a Difference and tagged author, biker, Happiness, happiness recipe book, Happiness recipe radio, Harley, humorist, inspiration, June Cline, podcast, southern women, speaker by Myra McElhaney. Bookmark the permalink. Tickled, honored and thrilled to be one of the women who inspire you, my friend. Right back at ya. We have laughed and cried through thick and thin. Oh, didn’t need to bring our hips in to it did I? I adore you, my friend. MeanIt!